Livingston moved to within a point of second-placed Dundee United in the Championship with victory at Falkirk. 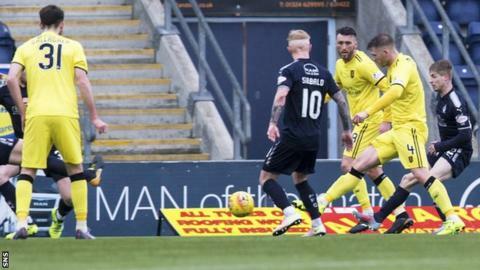 Lee Miller and Ryan Hardie were denied by Falkirk goalkeeper Robbie Thomson before Livi's Alan Lithgow tucked in a low shot following a free-kick. Jordan Thompson crossed for Hardie to head in via the underside of the crossbar and Raffaele De Vita's free-kick found its way in for the third. Alex Jakubiak struck to pull one back for the Bairns, who are tenth. Match ends, Falkirk 1, Livingston 3. Second Half ends, Falkirk 1, Livingston 3. Raffaele De Vita (Livingston) wins a free kick in the defensive half. Foul by Alex Jakubiak (Falkirk). Steven Boyd (Livingston) wins a free kick on the left wing. Foul by Raffaele De Vita (Livingston). Joe McKee (Falkirk) wins a free kick on the left wing. Attempt saved. Joe McKee (Falkirk) right footed shot from long range on the left is saved in the bottom right corner. Foul by Gregor Buchanan (Livingston). Substitution, Livingston. Gregor Buchanan replaces Ryan Hardie. Attempt saved. Rory Loy (Falkirk) left footed shot from outside the box is saved in the bottom left corner. Corner, Falkirk. Conceded by Scott Pittman. Substitution, Livingston. Josh Mullin replaces Nicky Cadden. Corner, Falkirk. Conceded by Declan Gallagher. Peter Grant (Falkirk) wins a free kick in the attacking half. Substitution, Livingston. Steven Boyd replaces Lee Miller. Attempt missed. Louis Longridge (Falkirk) right footed shot from the centre of the box is close, but misses the top right corner. Foul by Jordan Thompson (Livingston). Joe McKee (Falkirk) wins a free kick in the attacking half. Rory Loy (Falkirk) wins a free kick in the attacking half. Scott Pittman (Livingston) wins a free kick on the left wing. Substitution, Falkirk. Joe McKee replaces Lewis Kidd. Attempt missed. Raffaele De Vita (Livingston) right footed shot from outside the box is high and wide to the right. Goal! Falkirk 1, Livingston 3. Alex Jakubiak (Falkirk) right footed shot from the centre of the box to the bottom left corner. Assisted by Craig Sibbald. Substitution, Falkirk. Rory Loy replaces Andrew Nelson. Ryan Hardie (Livingston) is shown the yellow card for a bad foul. Foul by Ryan Hardie (Livingston). Jordan McGhee (Falkirk) wins a free kick on the left wing. Andrew Nelson (Falkirk) wins a free kick in the attacking half. Attempt missed. Ryan Hardie (Livingston) right footed shot from a difficult angle on the right is high and wide to the left. Lee Miller (Livingston) wins a free kick on the left wing.